Graduated from DMLHS in 1963 and then DMLC in 1967. John's first call was to Our Savior's in Zion, IL where he taught gr. 5-8 and was principal (taught with Lois Luetke!). Judy's first call was teaching gr. 2-3 at Christ Lutheran on the south side of Milwaukee. In 1968 we were married at Frieden's in Kenosha, WI. Classmates in our wedding include Jim and Joan (Enter) Tjernagel, Lois (Luetke) Kluender, Kathy (Pielmeier) Tegen, and Jim Duehlmeier. John continued at Zion and Judy taught Kindergarten at Bethany in Kenosha. In 1970 John accepted a call to Trinity, Marinette, WI to teach grades 5 and 6. He added coaching and being Athletic Director. Over the years he has taught multiple grades. Dan and Carrie and granddaughter Gabi live in Sturgeon Bay, WI where Dan is the Superintendent of the Sturgeon Bay School District. Carrie works part-time as a trunk keeper for Matilda Jane company and as the Executive Director of the Volunteer Center in Sturgeon Bay. Gabi is in 5th grade. Phil and Beth lived in Appleton, WI where Phil worked in insurance. He died in 2014 from cancer, so now heaven is his home. Beth and grandchildren Reid, Riley, Brynn and Kyra have remained in Appleton with their chocolate lab, Max. Christine lives in the Milwaukee area and is a physical therapist at River Center downtown Milwaukee. Judy had been teaching half-time at Trinity, Marinette since 1987 in the lower grades. 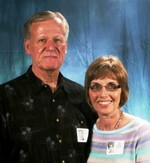 Judy shared a classroom with several teachers over the years including John! We had a unique situation and enjoyed teaching together the last several years of our Ministry. In December 2015 we retired. In February 2016 we enjoyed a trip down south taking in sights in Florida and Alabama plus many others along the way. It was our first trip out of the Midwest! Being together with our family is tops with us. Gabi, Reid, Riley, Brynn, and Kyra are such a joy for all of us. What a blessing from our Lord! Goals: Work at being healthy and someday jog to our own funerals! Note: We graduated on the 450th Anniversary of the Reformation. The 500th Anniversary is this year (2017) and, while we are no longer teaching, we still enjoy subbing when we are needed. Judith Schewe Tjernagel has a birthday today. Judith Schewe Tjernagel updated her profile. View. Judith Schewe Tjernagel added a comment on her Profile.